An old world vibe permeates Astor. The interior glitters and shimmers; there’s a 1950s marble countertop and elegant white tiled walls all set off against a backdrop of mirrors, providing the illusion of space. The crowd is more mature than at some city hangouts and evidently has money in its pockets. A warm, vibrant feeling filters through the room as people chow down on spicy meatballs and plates of steak, washing things down with a cool draft beer or maybe with the citrus kick of a caipirinha. 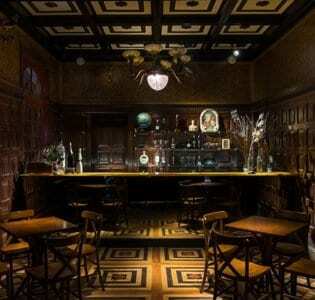 Located in the bohemian Vila Madalena district, the place has become even more popular thanks to its speakeasy-style downstairs club, the Sub Astor. Here things are all together livelier than in the refined space above, though both venues have a lot to offer.